I was lying in bed when I learned of the novelist's death. Awaking from a long dream filled only with incoherent darkness, my mind was still a blur as I reached out for my iPhone next to the pillow to check the time. As my eyes rested on the little screen, I found the news in the Top Stories section. It was a single sentence made up of tiny characters. I understood the words but couldn't quite grasp the meaning. I tried saying aloud "Hmmm"—then again, "So he died." I felt like talking to someone about it, but had no idea whom to call or how to bring up the subject. I just went on staring at the screen in silence. The novelist had apparently been in treatment for some time. The news reported that the funeral was attended only by his immediate family and a few near relatives. Yet he had so many readers—everyone must be talking about it now. The thought somehow depressed me. I was supposed to leave the house in two hours, but I no longer felt like going to work and punching in numbers on the register, dealing with people, dismantling cardboard boxes, returning goods, sorting bills, that sort of thing. I called in sick, apologizing and saying that I had a fever, and continued to lie in bed. When I next woke up, I had been sleeping for nearly five hours. It was early evening when I finally got out of bed. With nothing pressing to do, I walked over to the kitchen to wash some rice, and began to think about how I would spend the rest of the night. I owned every book the novelist had written. I had read them all. When I was younger, or even younger still, I had read them many times over from cover to cover. Well, so had a great number of other people, since he was the type of writer that most of Japan's reading population had read and loved. Still, I felt strangely agitated by the news. It wasn't sadness or frustration exactly—just a poignant sensation that something was caving in on me. Maybe I was going through a kind of shock. How do you say "shock" in Japanese? A blow? A sense of damage? The word "damage" isn't Japanese either, I stood thinking as I washed the rice. Maybe "anxiety" was the word to describe this sinking feeling, this state of submersion—the anxiety of not fully understanding because one is in the midst of turmoil. All I knew was the fact that I didn't understand. Come to think of it, it was a feeling that has been familiar to me since childhood—a feeling of huddling alone in a fog that would not lift. I set the timer on the rice cooker and sat down on the sofa, glancing at the bookshelf to see which one of his books I would hold in my hands. That didn't feel right somehow. I stood up and went back into the kitchen to make myself some tea. I was down to the last teabag. Inside the mug, the water swirled in various shades of brown. As I stared blankly at the patterns, I was remembering the words, the book covers, and . . . whatever it was from my teenage years when I first read his books. How should I explain it? It wasn't a particular smell or scenery that I remembered—nor was it our school uniform or any specific conversation. They were little snippets of things here and there that were surely there but no longer retrievable—like the road we walked on, the first time he told me about the novelist, the countless hours and days we spent together, the letters we exchanged. As I pulled out the teabag from the mug and placed it on the small plate, I remembered Amamiya. We were classmates in high school. On the train ride home from a school outing, I noticed Amamiya sitting by himself absorbed in a book. "What's that you're reading? Is it good?" I had asked, and so he had responded, looking up slightly with an expression that seemed to contradict what he said. From that point on, Amamiya would lend me books by the novelist whose name I had only heard of. I was immediately hooked, and we began to talk about all kinds of things—his novels, other novels, music that we were into. We discovered that we both loved reading since we were little. Neither of us had imagined meeting someone you could talk about books with, let alone someone from school. Soon, it wasn't enough to talk at school every day. We called each other on the phone, wrote letters. It didn't take long for us to become more than friends, and we started dating around the end of senior year in high school. We broke up the summer we turned twenty-one. One time, when Amamiya and I were walking in the botanical garden as we often did, we made a promise that we would see each other again if the novelist were to pass away. No matter where we are? Yes. Even if we're dating other people? Uh huh. So even if we're both married? Yup. OK. And if we're both really old and about to die? Yes. We decided to meet at the entrance to the botanical garden, at two o'clock on the first Sunday after the novelist died. It was a sad-looking garden, with no remarkable plants or interesting landscape to speak of, and not well maintained in the least. It looked ready to be closed down at any moment. But situated in a rural town tucked way in the mountains, the garden was immense and we could walk for hours—really, hours on end—completely engrossed in ourselves, sharing stories only we understood. In its vast grounds were a grassy field and even a small mountain, and when you climbed to the modest top and looked down at the foothills, you could see a lotus pond covered in deep green leaves stretching infinitely. The garden was always empty no matter what time of day or year you went. For company, we had only trees whose names we didn't know, or a giant pot filled with withered grass, or the occasional bursts of color from blooming flowers. As we sat looking at the glass windows of the greenhouse, cracked here and there and turned a brownish color, we would experience a sweet sensation that we were the last two people on earth. We didn't know anything about plants, but we loved the botanical garden that seemed to exist only for us. Today was Tuesday. I didn't imagine Amamiya would remember the promise we had made that day fourteen years ago, but if he were alive and well somewhere, he would certainly have heard the news of the novelist's death. And if he were to remember our promise . . . then, maybe . . . he would come. I took a sip of lukewarm tea and swallowed gently as I looked up at the calendar on the wall. Four more days, then Sunday. I spent the next four mornings and nights in a state of anticipation I had never experienced before. I was still anxious, but the anxiety was now tinged with a sense of nostalgia, illuminated by a light that reached toward me from far, far away. At the same time, I could feel a darkness reverberating somewhere deep below. When Sunday morning arrived, I moisturized my face and drew in my eyebrows with more care than usual, and put on a skirt I really liked but rarely wore. I boarded the train, feeling slightly ashamed of my own eagerness. I had moved to Shikoku prefecture when I got married, and after my divorce five years ago, I moved again to a town near the mountains and took an office job at a university in Kyoto. That didn't last long either. I wonder if Amamiya still lives in that town. He was going to a university in Kyoto back then, so there's a chance . . . I was the only one who got off at the station. The train was nearly empty to begin with, and when I reached the station exit there was no one working there. I thought about ringing the bell to call someone, but exited the small station in silence and walked slowly along the road that led to the botanical garden. I felt overwhelmed by all that greeted my senses. Everything seemed to unravel with each step I took, so that I no longer knew what stage of life I was living in. The print of the dress I was wearing, my new shoes that pinched my feet. That time I pretended to be angry to make him upset. The leaves of the big tree casting a cool blue shadow upon the ground, parched from the heat of the summer. The thirst. How I had wished then that I would never forget. It all came back to me now. I was once again walking down the familiar road to the botanical garden, as if the long stretch of time between this moment and the last had never existed. Amamiya would be waiting for me at the garden. Has he already traced these steps? Or is he about to? We broke up because Amamiya had fallen in love with another girl. "I didn't mean for it to happen." He hung his head, apologizing again and again. "There's nothing I can do." Naïvely, I had believed that we would be one of those couples that would be together until the very end. Perhaps it's not uncommon to feel that way at that age, but I had really believed we were special among the millions of other couples in the world. It had never occurred to me that Amamiya might fall in love with someone else, and so I had a hard time believing his words. "What do you mean, you didn't mean for it to happen? What could possibly happen aside from you and me?" He didn't answer. Watching him, I started feeling as if I were playing a role in some clichéd breakup drama. Eventually, I fell silent. But it was all real, and just as Amamiya said there was nothing he could do, there was nothing I could do but to drag along my misery for years and years afterward. After all of that, I am going to see him today . . . or maybe I should say, because of all that. I will see him . . . and then? Of course, I no longer had any romantic feelings. Everything was in the past. My heart still gave a tug when I looked back, but it was normal to feel a pang when remembering certain moments of one's life. Surely it had nothing to do with Amamiya. I took a deep breath and thought to myself. How incredible it is that we can meet after all these years, after so much has happened. We'll see that we're both happy and well, and have a nice conversation over tea with smiles on our faces. Isn't that fantastic? I exhaled deeply. Two o’clock came. Ten minutes passed, then twenty-five minutes. Nothing happened. I stood in front of the rusty gate, fiddling with my iPhone and scrolling through the news as if to deny the fact that there was no one in the world who wanted to come see me. I clicked link after link, glancing over whatever appeared on the page. I no longer knew what I was doing there. I looked up to see a cat slowly walk past an abandoned bicycle that was all scratched up. Suddenly, I felt overcome by loneliness. It was the kind that was a perfect mixture of all the lonely feelings I had ever experienced, and I didn't know why I felt this way. No matter how old I become, I will still go on like this, not knowing. There was some comfort in that, to be sure. It was because I felt comfort in my naïveté that I could repeat the same thing over and over again. I'm going to grow old like this, left behind in the same old place, all alone, forever. I looked down. As I shifted my feet, I could see that the coating on my heels had scraped off. They weren't like that when I left the house this morning. When I checked the time again, two hours had passed. I'll leave in five minutes, I told myself. The train was nearly empty. I slumped in a seat at the end of the car, looking absentmindedly out the window. After we passed a few stations, a man with an enormous backpack towering over his head boarded the train. The sound of his brown hiking boots echoed through the car. He sat down next to me, took out a small paperback from his back pocket, and started reading intently. It was a book by the novelist. He sat gripping the paperback, discolored and torn from repeated reading, and after a while looked up and let out a sigh. Our eyes met. "What a pity," he said and turned the cover toward me. I was taken aback at being spoken to by a stranger, but replied, "Yes, it is." Before realizing it, I continued, "I wish he could have written more." "Me too." The man smiled at me faintly, glancing back down at the book. "But he wrote so much already, maybe that's enough." He looked up again and said with a laugh. "He wrote so many novels. All that he left behind, we could spend the rest of our lives reading them. He left so much behind for us." With that, the man fell silent and returned to reading. After half an hour had passed, he got up three stops before my station, and raised his hand as if to signal good-bye. I raised my hand slightly in response. As the door closed and the train resumed motion, the man quickly disappeared without looking back. The train passed through a familiar landscape with its usual speed and heading toward the usual station. Still, I felt as if I were being carried off to some space and time that were no longer in the present. Three more stations, three more stations, I repeated in my mind and closed my eyes, unable to resist the sudden wave of drowsiness that came over me. I knew I was being lured into deep sleep, but couldn't keep my eyes open. If I fall asleep, where will I be when I wake up? Could I ever wake up somewhere utterly unfamiliar and new? My thoughts began to wander, but I knew that when I opened my eyes, I would be at my usual station. From there, I would walk down the same street back to my apartment, stick the key in the doorknob, and return to the same room. A new, unfamiliar place—a place where no one knows. There's no way of arriving there, because such a place does not exist anywhere in this world. Also from Japan, another story of place and memory. From Egypt, a poem about a return to a former place. © Mieko Kawakami. By arrangement with the author. Translation © 2015 by Hitomi Yoshio. All rights reserved. for Where Have All the Sundays Gone? 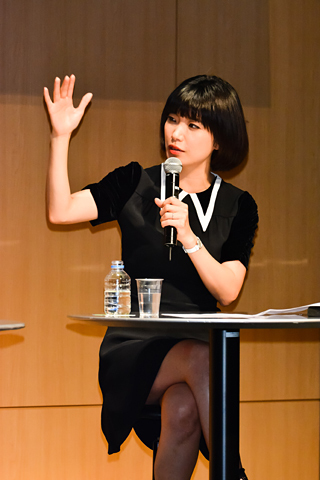 Mieko Kawakami in 2014, giving a lecture in Tokyo. By Mikawon, 2014. Mieko Kawakami (1976–) was born in Osaka. Her first break was as a musician; she made her major-label debut in 2002 and went on torelease three albums. Eventually she branched out into writing, first submitting poems to literary magazines and then earning an Akutagawa Prize nomination for the 2007 short story "Watakushiritsu in ha-a, mata wa sekai" (Myself and a Toothache), which was published in the prestigious Waseda bungaku journal. She won the Akutagawa the following year with her next work, the novella Chichi to ran (Breast and Ovum). 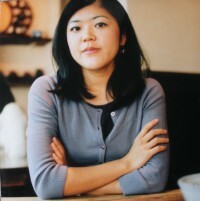 In 2010 Kawakami further established her writerly reputation by receiving the MEXT Award for New Artists and the Murasaki Shikibu Literary Prize for her first full-length novel, Hevun (Heaven), a story of love between two middle-school students bullied at school. She added to her honors in 2013 by winning the Takami Jun Prize for her poetry collection Mizugame (Water Jar), and the Tanizaki Jun'ichiro Prize for her short story collection Ai no yume toka. Hitomi Yoshio is an assistant professor of Japanese literature at Florida International University. Her research interests include modern and contemporary Japanese literature with a focus on women’s writing. Her translations of Mieko Kawakami's works have appeared in Monkey Business: New Writing from Japan, and another is forthcoming from Denver Quarterly. She received her PhD from Columbia University in 2012. Listen to translator Allison Markin Powell pronounce the Japanese names from this story. Look at a photo of a passenger waiting for a train in rural Japan. Watch an interview with author Mieko Kawakami filmed during a literary translation workshop. Read about Japan’s “Love Confessing” culture. Kawakami and Yoshio also collaborated on the story "A Once-Perfect Day for Bananafish.” The title is an allusion to a story by American author J.D. Salinger. Readers of Japanese can check out Mieko Kawakami’s blog. Read another story of high school love: Skim, a graphic novel by Jillian and Mariko Tamaki.